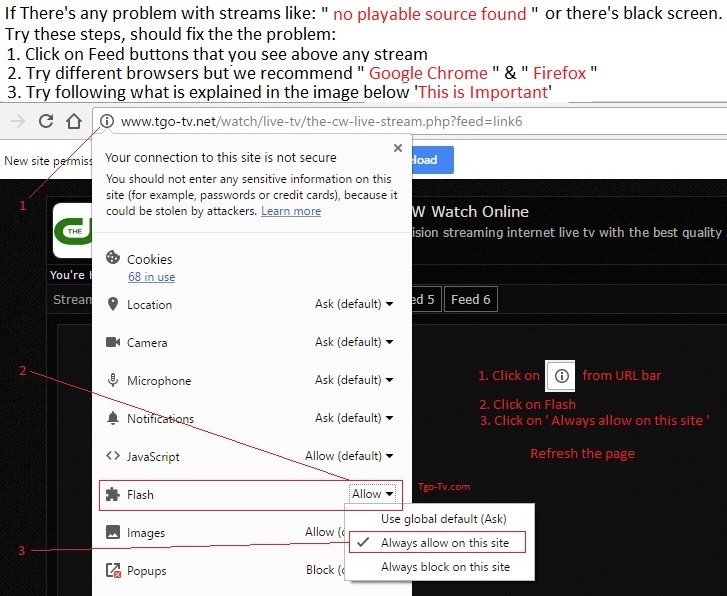 Read Chat Rules: Stream Not Working ? 1- We recommend using Google Chrome or Firefox browsers. 2- If still have problem, Try clicking All Feeds you see above Player (Green Buttons) and see which one works best for you. 3- Try clearing browser cache. 4- Disable IPv6 if possible (causes problem with some players). 5- Enable Flash Player as you see Here. 1 - English only (or Click on Non-English Chat). 2 - No Outside Links , No Bullying. 3 - Only Mods can post Links. 4 - No Harassing other users. 5 - No Flooding or Spamming. 6 - No posting of private contact information. 7 - Racism of any type not allowed.